Wind turbines are generally divided into two broad categories based on their rated capacity and their intended applications. Small wind turbines are typically less than 50 kW in size, but can be as large as 250 kW and are designed for use in residential, agricultural, small commercial and some industrial applications. In all of these applications, the turbine(s) are providing energy for the end user to offset the use of grid power. Small wind turbines can be grid-connected for residential or industrial electricity generation or they can be used in off-grid applications such as water pumping or battery charging. Small turbines are typically installed as a single unit or in small numbers. The smallest turbines (with power ratings less than 1 kW) are normally used to charge batteries for sailboats, cabins, and small homes. Turbines with power ratings between 1 kW to 20 kW are normally used for water pumping, small businesses, residential power, farm applications, remote communication stations, and government facilities. They are often found as part of a hybrid system that can include photovoltaic cells, grid power connections, storage batteries, and possibly back-up diesel generator sets. Turbines rated at 50 to 250 kW are used in light commercial/industrial, larger farms, and village power applications. Large wind turbines are most commonly deployed in large arrays of multiple turbines. Less common, but increasingly of interest to municipalities or electric cooperatives, large turbines are also installed in distributed generation applications that consist of a single or a few turbines connected directly to a distribution line. Many large wind turbine manufacturers are offering models in the 1 MW range. Wind turbines as large as 1.8 MW are available for land-based applications in the U.S. For offshore environments, manufacturers are testing designs in the range of 3-5 MW. 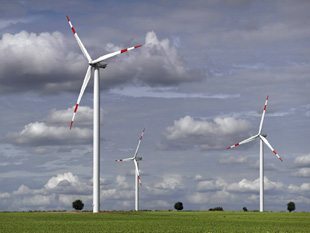 Examples and information pertaining to both large and small wind turbines are included in this guide. Although there is some overlap, the majority of the technical issues, permitting requirements, and operating procedures are different for large and small wind turbine applications. Therefore, it is important to differentiate and address the large and small wind turbine applications separately rather than trying to address them with the same set of regulations or review processes. Large-scale applications are likely to have more impact on a community. how you compare the efficiency ratio of small wind turbine vs large wind turbine, considering the the operation wind velocity range and the power conversion efficiency? Very valid information i read from EEP. Hence please add me an member of your board. Thank you again! If you have any suggestion or remark feel free to post here! Iam basically electrical Engineer having 34 years experience, worked in LV & MV Switchgers. Presently I am in Kingdom of Saudi Arabia in one of the Top 10 industry named as Alfanar Electrical Systems since from 2008. My Job responsibility is development of new product – named as bus bar trunking and LV & MV Bus duct. This is mt brief introduction of mine. Iam very happy to read information from EEP. Thank you sir! Glad you find it usefull!